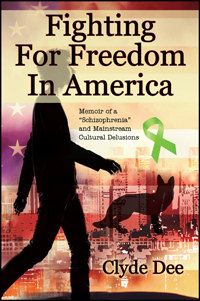 Synopsis: In the frontiers of america's mental health institutions, fighting for freedom can become very personal. Six years in to a protected clinical career as a mental health counselor, Clyde Dee moves to Seattle, and takes a job in a section 8 housing project. Getting to the bottom of what's going on in a fractured system, he becomes embroiled in the politics of the local drug war until he decides to go off a small dose of anti - psychotic medication. Clyde then faces treats and a reconceptualization of a fractured past and is stopped by the police in an effort to exit the country. He is incarcerated in a psychiatric ward for three months and released to the streets in the years that follow, he moves through american disparities and cultural delusions, facing some of his worst fears come true, and striving to gain back what he lost. Review: First of all l would like to say a big thank you to Clyde Dee for sending me his book and giving me a chance to read this story. I was sent this book in exchange for a honest review. I am glad this book is on my bookshelf. I would tell people that you should step outside your comfort zone with books because it is good to add more authors and genres to your reading portfolio even if you do not read books like this. I normally do not read books of this genre but l stepped outside my comfort zone authors and genres l am so glad l did because l have read so many great books. I highly recommend this book. the author is really nice and kind. I was sent this book by bostick communications who l want to say a big thank you to them as well. I really enjoyed this book l liked this storyline and l found this book really easy to get in to and it was very hard to put down once l started reading it. I loved reading about Clyde's life. I loved that he got a dog named Maxine and a kitten buddy. I love reading memoirs now. This book has 321 pages it did not take me that long to read it. Sometimes l just lie on my bed reading this book and cuddling with my kitten who is called Oscar. I was sad to read that Clyde's bike was stolen and his flat was trashed and his cat litter was thrown all over his floor. Clyde sounds like really brave. I really found this storyline a great read and it sounds like is a great guy who overcome a lot in his life. I like that Clyde gives a sandwich to a homeless person. This book took me 5 days to read.I would love to read more from the author and more about this story and a bit more about Clyde and his life. This is a great book wish l could rate this book more than 5 stars this book is a must read i would tell people to read this book themselves to see how great it really is. I fell in love with this book. I would happily read this book again and again.